Cicero's De Officiis is, on its surface, a letter from Cicero to his son Marcus. It was, however, clearly intended for a much wider audience. The essay is about making decisions: how should we distinguish between right and wrong, and how should we determine, in any set of circumstances, how to behave? Cicero's essential message is clear: if we are always kind and considerate of other people, we cannot go wrong, but, if we think only of ourselves, we will always go wrong. This translation of Cicero's work is intended for anyone interested in Roman history or ancient philosophy, in reading the classics in translation, or in contemplating how to do the right thing. Marcus Tullius Cicero (3 January 106 BC - 7 December 43 BC), was a Roman philosopher, politician, lawyer, orator, political theorist, consul and constitutionalist. He came from a wealthy municipal family of the Roman equestrian order, and is widely considered one of Rome's greatest orators and prose stylists. His influence on the Latin language was so immense that the subsequent history of prose in not only Latin but European languages up to the 19th century was said to be either a reaction against or a return to his style. Cicero introduced the Romans to the chief schools of Greek philosophy and created a Latin philosophical vocabulary (with neologisms such as humanitas, qualitas, quantitas, and essentia) distinguishing himself as a linguist, translator, and philosopher. His writings still form a core curriculum supplement for the study of Latin. 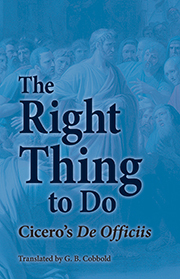 Ably translated into English for an American readership by academician G. B. Cobbold (Classics Department, Tabor Academy, Marion, Massachusetts), The Right Thing To Do: Cicero's De Officiis is the newest title from Bolchazy-Carducci Publishers and will be welcomed as another Latin studies supplemental curriculum reading list. In addition to an extraordinarily informative introduction, this edition is enhanced with the inclusion of three appendices, a glossary of Names, Places, and Technical Terms, Significant Dates in Roman History and the Life of Cicero, and recommendations for Further Reading. While of primary value for academic library Latin Studies collections, The Right Thing To Do: Cicero's De Officiis will also prove to be of immense interest to non-specialist general readers with an interest in the ethics of 'doing right' in contemporary ordinary life.